March 13, 2015, 7:30 p.m. Please join us in singing the second chorus. Please join us in singing the chorus. This evening’s concert is made possible through the generosity of our Donors. Thank you! 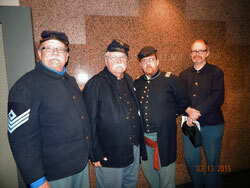 Symphony West welcomed Civil War reenactors from the 29th Ohio Volunteer Infantry Living History Association at its March, 2015 concert. 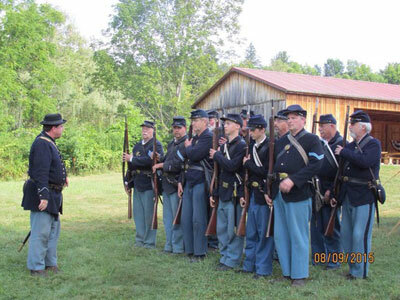 The 29th Ohio Volunteer Infantry (OVI) Company G is a civil war living history association from in and around Northeast Ohio, where the original 29th was formed. Our organization was started by a group of seasoned re-enactors desiring to portray this local regiment and keep their memory alive. We are a non-profit 501(c)(3) organization that is actively involved in local, state, and national Civil War events. It is our desire to honor the memory of those men who served in the 29th Ohio Volunteer Infantry by accurately portraying the 1861-1865 time period. We not only portray the life of the soldier in the war but also the civilians on the home front who had a vital part in supporting these men. 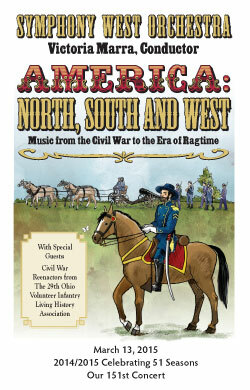 We do so through reenactments, parades, living history presentations, educational programs, and preservation projects. The 29th OVI is an organization of dedicated members, both re-enactors and historians, interested in preserving the history of the Civil War and the 29th Ohio. We desire to do this through educating the general public; especially children, who are the future of our country. We feel that the Civil War is an important part of our history and it is our hope that the memory of those who lived and died during this war will never be forgotten. As part of our desire to keep their memory alive, the members of the 29th OVI have took on a project to conserve the original regimental battle flag of the 29th Ohio. This flag is part of the battle flag collection at the Ohio Historical Center and needed to be conserved so it could be placed on display for all to enjoy. The cost of conservation was $14,600. We are pleased to say that this project was completed in the summer 2014. The flag went to the conservator in the fall of 2014 and should be back at the Ohio History Center to be displayed sometime in the Fall of 2015. The 29th OVI is always looking for new recruits and members; we would love to have you join us as a soldier, civilian, or historian. We will be glad to help you get started in this hobby. We are always accepting donations of any amount for historic preservation projects. Please visit our website www.29thovicompanyg.org for more information about our group, becoming a member, or donating to historic preservation. Email us at 29thovicog@gmail.com with questions or presentation requests.